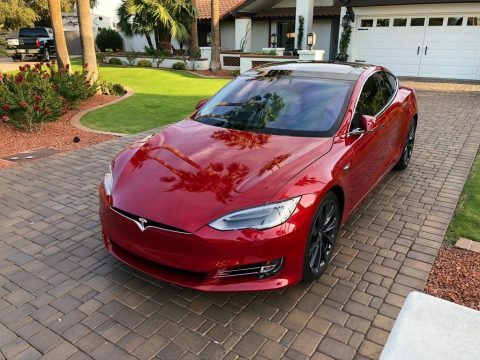 2018 Tesla Model S P100D For Sale in Peoria AZ 85381 This FULLY LOADED 2018 Tesla Model S P100D is proudly shown in a Red exterior with Parchment interior. Powered by all-Electric 745HP Dual Motors, All Wheel Drive system that makes this about one of the fastest vehicles on the planet. With this single speed transmission, it provides you with an estimated driving range in excess of 385 miles per charge. This Model S comes FULLY LOADED with EVERY option available, and Ceramic Tinted Windows. Why wait 8-10 weeks for a new Tesla, when you can get this Beauty today, and save over $20,000! Features and Upgrades Clear Bra All the Way Back to the Doors, Mirrors and Trunk Deck Enhanced Autopilot Full Self Driving CapabilitiesHigh Speed Charger 21" Sonic Carbon Twin Turbine Wheels Premium Interior385 Mile Range All Glass Panoramic Opening Roof Premium Interior Lighting Ludicrous Plus Speed Upgrade Extended Battery Range Upgrade Carbon Fiber Decor Ultra High Fidelity Sound Package Premium Interior and Lighting Smart Air Suspension Red Brake Calipers High Amperage Charger Upgrade Subzero Weather PackageCarbon Fiber Rear Spoiler Please call (402)502-8385 for more information. ATTENTION BUYERS! *Caveat Emptor* Please Remember to Inspect Vehicle Prior to Purchase!